Photo: Nishiki-do, inside Hiroshima Bus CenterSweet roasted manju buns made in the shape of the Japanese maple momiji, Hiroshima’s prefectural flower and tree. At the Nishiki-do inside the bus terminal, premium Hokkaido Tokachi azuki sweet beans are mixed with natural spring water from Mt. Hinoura to make anko bean paste, which is then wrapped in freshly baked sponge cake. Their simple, lightly-sweetened flavor is beloved by people of all ages. 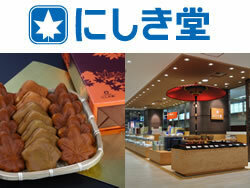 Momiji Manju have been certified as part of “The Hiroshima Brand”, and they remain a consistently popular Hiroshima souvenir among visitors. Hiroshima Bus Center Building 7th floorHiroshima-style okonomiyaki is made by extending batter into a circle, piling cabbage, bean sprouts, pork, fried noodles, eggs, and other ingredients on top, cooking them all on an iron griddle, and flavoring them with special okonomiyaki sauce. 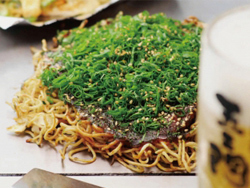 The two main styles of okonomiyaki are Kansai and Hiroshima. Hiroshima-style is distinctive for its extended batter, its ingredients and the order in which they’re added, and for how they’re compressed together using spatulas. We hope you enjoy the taste of authentic Hiroshima-style okonomiyaki. Copyright (C) Hiroshima Bus Center co., All Rights Reserved.